Rising costs and steep anti-dumping duties in the United States and Europe, coupled with a desire to expand overseas, are increasingly driving major Chinese solar panel makers’ new investments away from the domestic market, the world’s largest, to neighboring Thailand. Despite slowing economic growth in China, many domestic solar power companies are making a beeline for Thailand, where supportive government policies, growing demand and a host of other factors combine to offer high-growth opportunities and low-duty export potential. Declining prices, overcapacity and rising costs related to office rents, labor and operations in China are not helping matters either. For instance, an office in a prime location in Thailand’s big cities costs about $21 per square meter per year, much lower than Shanghai’s $46.8, according to the US Colliers International. The US anti-dumping duties have also savaged the bottom lines of Chinese solar panel makers in the last couple of years. The US Commerce Department had raised average duties on Chinese products but lowered them for Taiwanese products. At the end of 2014, US import tariffs on made-in-China solar energy products were as high as 165 percent, way below the 27.55 percent levy on comparable made-in-Taiwan products. According to the China Chamber of Commerce for Import and Export of Machinery and Electronic Products, the US tariffs have reduced the value of Chinese exports by about $300 million last year, squeezing profits of more than 200 Chinese solar panel makers. One of those affected was Yingli Solar, the world’s second-largest solar panel maker. The Baoding-based company has not reported profits since 2011 as overcapacity and the attendant excessive production caused prices of solar products to plunge. The cash-strapped solar giant is undergoing a debt restructuring process as its current liabilities surged to 18.4 billion yuan (2.8 billion), according to its financial statement of the first three quarters. A solar panel, or module, consists of a series of silicon cells which are joined together to form a circuit. A report by INS lnc, a Colorado, US-based research company, said in 2012, prices of poly-silicon, a material consisting of small silicon crystals and used in wafer production, and solar modules, plummeted about 48 percent and 44 percent year-on-year respectively. To cope, survive and expand, Yingli announced this month it has decided to set up a 40:60 joint venture to make multi-crystalline photovoltaic panels in Thailand, by partnering with a local player, Demeter Corp. Operations will start in the second half of this year. The panels will be sold under the Yingli Solar brand name. Yingli told China Daily the joint venture will also set up a $19-million, 300-mW solar power plant in Rayong, about 140 kilometers southeast of Bangkok. It has also partnered with Chinese telecommunications and electronics giant Huawei Technologies Co Ltd, which is also a big player in the photovoltaic inverter market, to provide a series of solar power solutions to the Thai market. Yingli, however, is not the first Chinese solar products company to venture into Thailand. The trend started last year when Yingli’s competitors such as Trina Solar Ltd and JA Solar Holdings Co announced ambitious expansion plans. 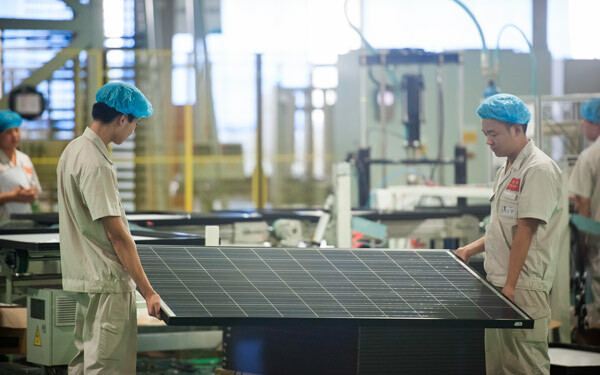 Trina Solar, a photovoltaic modules maker based in Changzhou, Jiangsu province, has set up regional headquarters in Singapore as demand for solar panels has grown rapidly in Southeast Asia. In May 2015, the company invested about $160 million to build its factory in Thailand, aiming to boost its solar panel supplies to the global market. This year, it will start construction of the factory that will have a capacity to make solar cells that can produce 700 mW of power annually and solar panels that can generate 500 mW of electricity annually. A key factor that appears to make Thailand attractive is solar panels made in the kingdom do not invite heavy duties in the US and Europe. Also, Thailand’s investment environment is considerd very stable. For instance, the government there supports the solar power industry in a number of ways. Last year, it rolled out measures to support a major expansion of the country’s solar power industry, especially the segment that makes solar panels installed on residential and commercial building rooftops. Since 2008, Thailand has been implementing its alternative energy development strategy, covering all sectors of clean energy, including large-scale solar power station projects. Experts said this lacuna actually presents huge potential for growth for Thailand’s domestic solar power market. It is also one of the reasons why Chinese companies are setting up factories in the country. Other reasons include Thailand’s heavy reliance on imported energy. Solar power development has been almost at a standstill since 2008. But the government has pledged to use more clean energy and reduce reliance on imported energy by building large solar farms. The Thai government plans to install 3 gW of solar power capacity by 2021 as part of its efforts to meet its target of generating 20 percent of total electricity from renewable energies. Towards this end, the country has created a pro-business climate that is marked by tax incentives and continued government support for the expanding solar power industry. Experts said expansion into Thailand could help Chinese solar panel companies to not only avoid heavy anti-dumping duties of the US but export their products to Europe as well. More than 60 million photovoltaic modules made by Yingli Solar are in operation in Germany, Spain, Italy, Greece, Japan and South Africa, the company said. Overseas expansion of Chinese firms reflects their confidence that the global solar power market will likely recover sooner or later, experts said. Chen Jie, director of both the Solar Energy Center of the National Institute of Clean and Low-Carbon Energy and the Beijing Engineering Research Center for Nanostructured Thin Film Solar Cells, expects climate-conscious European countries to increase use of renewable energy, especially through rooftop solar panels. So, demand for solar panels may well rise in Europe, entailing export and growth opportunities for Chinese firms with facilities in Thailand.